AC Milan have reportedly agreed a €35m+ deal to sign Genoa striker Krzysztof Piatek, which in turn should finally unlock Gonzalo Higuain‘s move to Chelsea. As noted by the Evening Standard, the 31-year-old is said to be set to complete his switch to Chelsea, but the hold up ultimately centred around Piatek’s move to the San Siro. 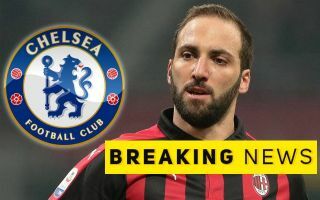 As per Sky Sport Italia’s tweet below, it is reported that a €35m plus bonuses deal has been struck to take the Polish international to the Rossoneri, which in turn now ultimately opens the door for Higuain to wrap up his arrival at Stamford Bridge. It was a sensible touted approach from the Italian giants, as they would undoubtedly have wanted to have the reassurance that Higuain’s replacement was signed before allowing him to cut short his season-long loan move from Juventus. With a deal in place for Piatek, that should now result in them giving the green light for the Blues to add a new striker to their squad, with the Argentine ace set to secure a reunion with former Napoli boss Maurizio Sarri. Higuain struggled at Milan through the first half of the campaign, managing just eight goals in 23 appearances. In contrast, Piatek bagged 19 goals in 21 outings for Genoa, and he’ll hope that he can now successful make the step up in quality to lead the Milan attack alongside youngster Patrick Cutrone. Gennaro Gattuso’s side moved back into fourth place in Serie A on Monday after their win over Genoa, while Sarri is under pressure to deliver on a similar objective as the Blues continue to battle to keep hold of a top-four spot in the Premier League. Adding a player who scored 38 goals in just 42 games under Sarri in the 2015/16 campaign should certainly help them.